Your 1917 half dollar value changes greatly depending on the mint that produced the coin and where on the coin they placed their mintmark. Three mints produced silver half dollars in 1917 and two of them, Denver and San Francisco placed mintmarks on their coins. What is significant, during the year the location of the mintmark was moved from the obverse to the reverse. 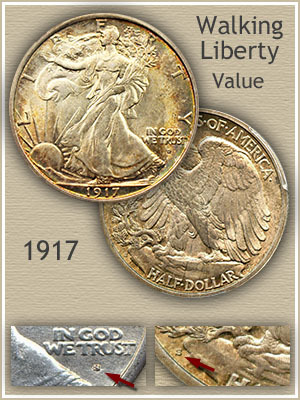 Examples of each are collected resulting in five variations of a 1917 Walking Liberty half dollar. Examine your coin closely, determining the correct variety results in a distinct change the value of your 1917 half dollar. Images identifying theses separate mintmark locations are just below the value chart. These older silver half dollars in the Walking Liberty series are avidly sought by collectors willing to pay high prices for the right coin. Date, mintmark and location as well as condition drive your 1917 half dollar value. Mintmarks determine how much your 1917 half dollar is worth. An exciting year in half dollar production, 1917 and the various mintmark locations results in many variables. The mints striking your coin were either Philadelphia, San Francisco or Denver. Mintmarks identity the facility, "S" for San Francisco, "D" is the mark of Denver and no mark for Philadelphia. Locations are either on the obverse under "In God We Trust" or the reverse along the rim tucked under the branches in front of the eagle. A 1917 half dollar is often a date that shows up in a box old coins, and an exciting find if as nice as the example shown. True, mint marked issues of 1917 are valued even higher, however this coin stands out because of its remarkable condition. Care in handling has preserved its "original quality" which is seldom seen. Reaching $793 at a David Lawrence Rare Coin Auction, bidders competed to secure a gem Walker for their holdings. Golden hues of color surrounding a center of bright silver blue help raise this coin to gem status. Finding an old silver half dollar with no wear, few minor abrasions and stunning colorful toning is rare. You group of old coins has the potential to yield quality examples to satisfy many collectors assembling sets of Walking Liberty halves. 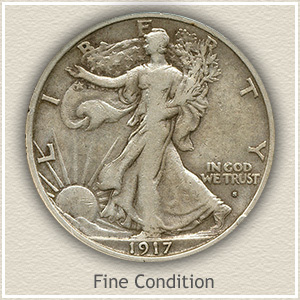 The value list shows many 1917 half dollars in various states of preservation are worth far above their silver content. Collectors strive to add nicer condition halves to their collection and generally fewer of these old silver half dollars survive in better condition. To accurately place a value, each are judged and a "grade" is resolved. Dealers and collectors both use the terms found below. 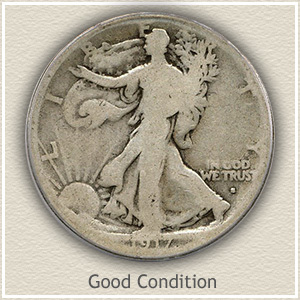 Compare your coin to the images and descriptions, finding the grade and 1917 half dollar value. 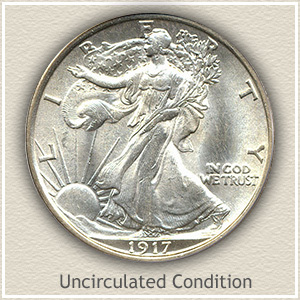 Uncirculated: An uncirculated coin must not have any wear. Its appearance retains the original mint luster, the shine of a new coin. When tilted from side to side an unbroken silver-white shimmer extends from rim to rim. Any wear from circulation shows as a "softening" and dulling of what should be very sharp features. Uncirculated condition separates the common from rare silver coins. Good: In the heavily worn "good" condition this old silver half dollar depicts Liberty as an outline. From her outreaching arm to her foot all details are now worn smooth, only major folds in the gown are evident. The once protective rim is now touching the tops of some letters and fading into the date. In this condition most 1917 half dollar value is its silver value. 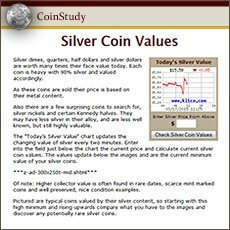 Return to Coin Values Discovery... find 1917 half dollar value and... a complete index of image and text links to all US Coin series, from Cents to Gold. Old coins retain a strong collector following. 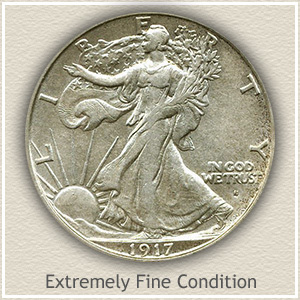 Walking Liberty halves are an example highlighing the value of silver in old coins. Additiionally, within each series are rare date and mintmark combinations with even greater demand. Revisit your box of old coins, today's value charts show a steady increase. Listing all dates and mintmark combinations of this very popular series. Many of these old half dollars are worth premiums to their silver coin values. After you check date and mintmarks, next compare your coins to the grading images and determine their condition. A small difference in preservation does have an effect on value. Silver Walking Liberty half dollars are in demand by dealers. These old coins are very liquid in the coin collecting market. 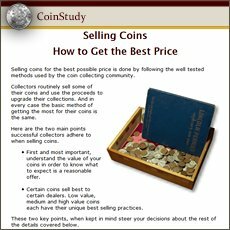 There are always buyers interested in purchasing your coins. Receive the highest price by separating the collectable from the bullion priced pieces. For more info see the Sell Silver Coins article.